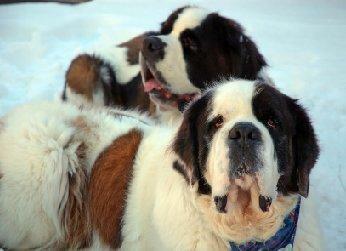 Meet the Saint Bernard, the heroic dog of the Alps. Who hasn't heard of the canine savior of the Alps? The Saint Bernard, named for the monk St. Bernard de Menthon who is believed to have founded the breed, has been used as a search and rescue dog in the Alpine pass between Italy and Switzerland since the 1700's. These dogs originally patrolled the Alps with their monk companions as they searched for hapless travelers caught in the snow, and it was here that the breed developed its legendary sensitivity for incoming storms and avalanches. Later on, the dogs were sent out in teams of two to patrol the slopes on their own. Once they found a wayward traveler, one dog would try to rouse him and lie on top of him to provide warmth, while the other dog raced back to the monks for help. Today, these dogs still serve snowbound travelers, but they are just as likely to be family companions. The Saint Bernard is a large dog with a massive head. The overall impression should be one of power tempered by intelligence. All things considered, larger dogs are more highly prized, as long as their weight is proportionate. This is not simply a fad for exaggeration, but in keeping with the job this canine was bred for. The breed comes in two coat varieties, short and long. The short coat is the original type, but short should not be mistaken for smooth. The hair is thick and plush, providing excellent insulation against the cold. The long coat was developed by cross-breeding with Newfoundlands. The thinking was that more coat would provide even greater protection from the elements, but just the opposite proved true. The longer ruff and fringes collected snow and ice balls, quickly weighing the dogs down and making them far less effective at their rescue mission. The monks returned to breeding for short-coated specimens, but the long coat always seemed to pop back up in succeeding litters and remains with us to this day. Both coats require little more than brushing, especially during the twice yearly shedding period. Bathing should be carried out sparingly, using a mild shampoo so as not to strip too much of the natural oils that make the coat so water-resistant. The area around the eyes should be wiped clean on a daily basis. The Saint Bernard enjoys a reputation as a gentle giant, but early training is necessary before these dogs reach full size. A two-hundred pound dog must be taught not to jump on people or pull on a leash if you hope to maintain control. As a rule, these dogs are fairly slow and methodical in their actions and quite eager to please, so living with them is easier than you might expect. They can make very good companions for children as long as they have received the training mentioned above. Although not particularly aggressive by nature, these dogs can make decent guard dogs, and their sheer size is enough to intimidate most would-be criminals. Additionally, this breed does not tolerate heat well, and is better off kept indoors in a controlled climate during hot weather. Like many larger breeds, Saint Bernards generally have a more limited life span averaging about nine years. Drool is simply a fact of life with this breed, and anyone considering bringing home one of these dogs should be aware of it. If you've ever seen the movie Beethoven, you already have a good idea. These dogs have loose jowls, and saliva does flow now and then, although this aspect was highly exaggerated in the movie. Most owners keep a towel or two on hand around the house for quick mop ups, and feel the clean up is a small price to pay in exchange for sharing their lives with one of these wonderful, loving companions. Saint Bernards are a very loyal and affectionate breed, but you should carefully consider whether you can handle a dog of this size and power. If you put the necessary time into training as a pup, your Saint Bernard will grow into a companion you can count on for years to come.